Frank Chapman loved birds. What he did not like was the killing of them for sport. What if, he proposed in his magazine, we quit shooting them and start counting them, instead, with our eyes and ears. And, the first Audubon Christmas Bird Count began. More than 100 years later, we birders take the counting of bird for this census very seriously! I have been involved in the CBC for much of my life, first as my dad’s sidekick, but now, I’ve taken over his spot counting owls. On our best night, my team, called the OMG (the Owl Moon Gang) called down 67 owls. Fly With Me with Jane Yolen, Adam Stemple, and Jason Stemple. 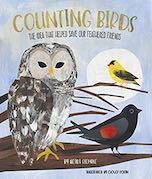 This book is filled with everything about birds, including true stories, folklore, nonfiction, poetry, science, and things you can do to help as close as your backyard and as far as foreign lands, This book promises to be the go-to book for kids interested in the world of birds around them—their songs, migrations, endangerment, and how to help. Just in time for the Year of the Bird. This book took more than 7 years and a lot of patience to finally become a book. But now readers can help Vic find his missing tooth! Because, he needs it for the tooth troll! 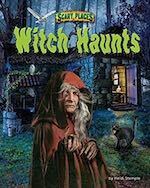 This nonfiction book about witches haunting places around the world is published by Bearport. The research and writing of this was fun because of the creepy nature of the subjects. Did you know that the ghosts of witches can be found all over the world? I found them (in my research) in Ireland, the United States, India, and Jamaica. Scary! 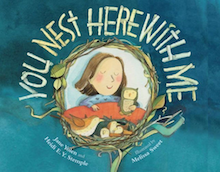 You Nest Here With Me This rhyming going to bed book took 11 years to get published. And, we love it so much, it was worth the wait. Melissa Sweet's magical illustrations are filled with hidden animals and the collage elements for which she is famous. This book, with the theme of 'home' at its core, is perfect for a sleepy child and a budding ornithologist. On the last pages is additional facts about each of the birds mentioned in the book. Did I mention that I am in love with this book? National Geographic's Book of Animal Stories with Jane Yolen, Adam Stemple, and Jason Stemple. The first collaboration with my whole family! This book is true stories about animals written by my brothers, Adam and Jason Stemple, our mom Jane Yolen, and me. We all chose our favorite stories to tell. And, National Geographic let us have not only a bibliography, but also a time line, a map, and additional back matter. A scratch and sniff book in the best selling How Do Dinosaurs... series. Fossilized Lemon Tracks and Cinnama-Saurus! In this sassy, irreverent encyclopedia of bad girls throughout history (Lizzie Bordon, Solome, Mata Hari, Bloody Mary, and many more) the facts are combined with good humor and a couple narrators who try to weigh the relative guilt or innocence of the feisty, fierce, and felonious females in the context of history and changing societal mores. The cherry on this sundae of badness? Illustrations by Rebecca Guay! In this follow up to Fairy Tale Feasts, traditional Jewish tales are pared with Jewish recipes (traditional like latkes and kugel and not so traditional like mini cheesecake bites) from my kitchen for families to cook together. Pretty Princess Pig is getting ready for a big party with all her friends! 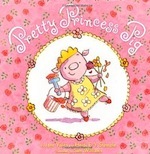 Princess Pig will have young readers laughing as she spruces up the dining room with a mess of paint and plaster, bakes a cake with gobs of batter and cream, and even digs up flowers with her nose all while (naturally) wearing her flowered party dress. This prissy pig with a heart of gold is sure to keep readers giggling as each page reveals a new mess that she is blithely unaware of. 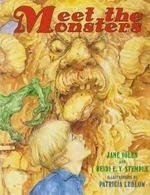 A guide book to the many monsters you might run into with instructions on how to get rid of them. Silver bullets for werewolves, stake or garlic for vampires, erasing the golem’s name, etc. The poems in this collection are written in the form of notes from a girl to her mother and then from the mother in response. The subjects run the gamut from body image to curfew, boredom to the death of a grandparent. What can Cinderella do with her magical carriage after midnight? She could make pumpkin tartlets! 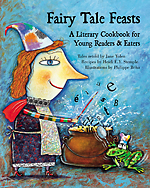 This cookbook pairs folk and fairy tales with recipes (Brer Rabbit/Carrot Soup, Little Mermaid/Seaweed Stuffed Shells, The Runaway Pancake/Pancakes). The recipes are kid friendly, but not made for kids only. Marginalia accompanies each section with facts about food and story. A great cookbook for the entire family to share. Fairy Tale Feasts has also been published in 4 separate volumes as Fairy Tale Breakfasts, Fairy Tale Lunches, Fairy Tale Dinners, and Fairy Tale Desserts. A collection of stories told traditionally on the stage through dance including Swan Lake, Coppelia, The Sleeping Beauty. Each story is accompanied by a full page of history of the ballet. Balletomanes will appreciate that Rebecca Guay’s art, unlike many ballet books, is anatomically correct, even in pointe shoes. The follow up to The Barefoot Book of Ballet Stories. Eight stories from eight different cultures with dance as their central theme. End-notes explain the steps for each of the dances. In this rhyming going-to-bed book, a young child is tucked into a bed filled with stuffed animals while real animals snooze in their trees, dens, borrows, and caves for the long winter’s hibernation. The hills are bare and steep. Your heart beats steady, strong, and slow. You wait till spring to rise and go. A collection of folk and fairy tales about mothers and daughters from around the world with commentary between the authors. 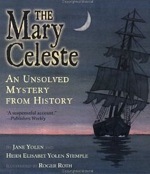 In this Unsolved Mystery from History,a young girl investigates the Mary Celeste, a ship that in 1872, was found less than a month after setting sail, the brig was in seaworthy condition and almost completely in order, but with no one aboard. Another of history's mysteries. 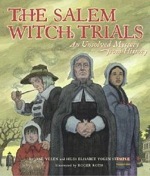 This time, our detective's intrepid daughter investigates the Salem witch trials. Also available in audio versions by Recorded Books. Another addition to the History's Mysteries series. 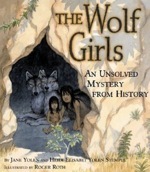 Were the two orphaned Indian girls abandoned by their parents or raised by wolves? 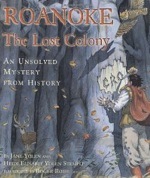 This Mystery from History has an entire colony going missing! Investiogate along with the narrator. In the Sleeping Bear Press states series, this counting book is all about Massachusetts. The book is filled with facts you may not know about the Bay State like the state fossil is a dinosaur track, basketball was invented here, and candy hearts have been made here since 1866. Here's a One if By Land Teacher's Guide! Ready For Anything: Training Your Brain for Expert Espionage Written in conjunction with a series that involves spy toys. This seemingly small book has a surprisingly large number of real spy facts including the best things to keep in your own spy kit, the connection between the boy scouts and spying, and how to hone your spy skills. Robert’s Snowflakes Haiku based on artists’ snowflakes sold at auction to raise money for cancer research. The entire project was for charity. Read more about it at GraceLin.com. Here’s a Little Poem; Me, Myself, and I; Baby Bug — "Ice Cream Cone" A poem about my love for ice cream! Published in all three of the above. Lady Bug — "First Flower" A tiny poem about the first green of spring. Spider — "The Lady and the Dinosaurs" An article about two Marys (12-year-old Mary Anning and Mary Ann Mantell) who were early discoverers --some say the earliest-- of dinosaur fossils. Falling Down the Page — "Under My Bed" A list poem (the book is a collection of list poems) about the party of items under a bed just before cleaning day. 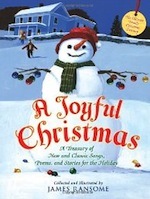 Nick Jr. — "My Favorite Time of Year" A poem about the winter holidays that young children can read along (with the help of rhymes and pictures). Been There, Done That — "Martha Stewart Blues"
A Joyful Christmas — "Dear Santa" A fictional short story based on my real life daughters written in a series of letters to Santa. It is about Christmas and foster care but mostly it's about family. Unexpected: 11 Mysterious Stories — "Max, the Hand, and Me" While on vacation, a boy finds the clues to the mystery of some missing jewelry on the beach with his dog Max. Mob Magic (For adults) — “Dream Job” A surreal tale of an assassin who is chased into another realm by the cop who is determined to put an end to the killings. All Lizzy wishes for is her family to be happy again. So, why can't her fairy godmother get it right? Or does Lizzy just have to change her definition of happy? Crafty Cat Crimes (For adults) — “Cat Nip” An orange cat won’t leave the scene of the crime and helps solve a perplexing murder. Great Writers and Kids Write Spooky Stories — “Daffodils” While visiting her grandmother, a girl discovers a ghost and helps solve a mystery. Perchance to Dream — "Holy, Holy, Holy" Ashleigh is a Jewish Unitarian, so she doesn't believe in visions... but, one appears to her anyway. Love Letters and Other Stories — “Opening Act” A girl learns about creative process when her brother (loosely based on my own brother Adam) uses her poem as song lyrics. Also published in Scope Magazine. American Girl Magazine — “Dollhouse for Dana” A young girl learns to accept a new step father when he memorializes her late dad in miniature. One of history's mysteries, the Mary Celeste.